On Saturday, November 18, 2017, the Pan-Cretan Student Conference on Road Safety took place at the OAC. It was organised by the OAC in cooperation with the Regional Directorate of Elementary and Secondary Education in Crete and the Municipality of Platanias. This conference was held on the occasion of the World Day of Remembrance for Victims of Traffic Accidents. Dr. Konstantinos Zorbas, General Director of the OAC, who was also responsible for coordinating the conference, welcomed the attendees, and stressed that “the main purpose of the Orthodox Academy of Crete is to help people come face to face with themselves, and thereby with their fellow human beings, in honest conversation, that is, in a joint search for the truth”. According to Mr. Zorbas, "Crete today also offers something else, undoubtedly useful for our current Pan-Cretan student congress: It contains, in microcosm, all aspects of what we call the "crisis of civilization". For these reasons, he welcomed the students who came to the Academy "in a joint effort to identify possible solutions for handling the problem of road traffic accidents". His Eminence Metropolitan Amphilochios of Kissamos and Selinon, President of the OAC, pointed out in his welcoming speech that “this conference is not yet an event attracting many, but it reveals the practical concern and interest of the Church in young people. It embraces the dreams of the young people of Crete with affection and love", of whom "we all feel proud"and to whom "the present and the future of Crete belongs". 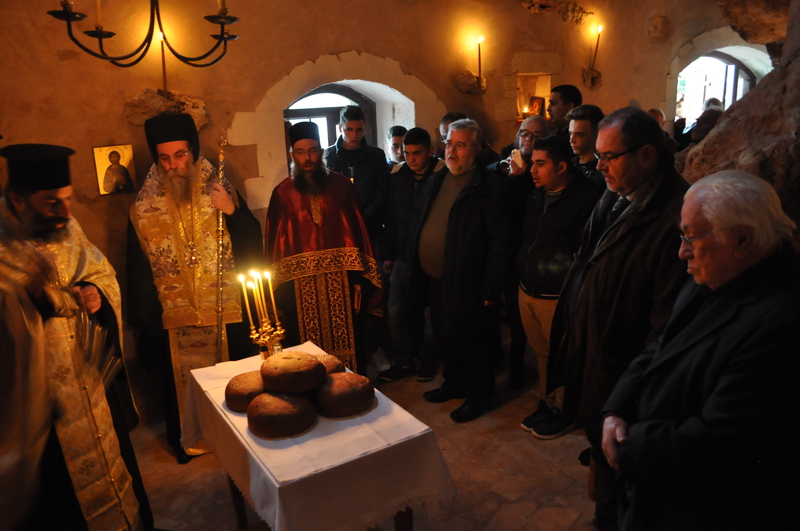 His Eminence Amphilochios urged young people, "To respect the great gift of God called life. Your own and everyone’s around you. On the journey of life, open your wings and fly...". But he also urged them "not to deny the values of life; to love, to dream, to fall in love, to respect the gift of life", because, as the poet says, "when time is against you, there is a price to be paid for flying." The main speech was given immediately afterwards by Mr Georgios Oursouzidis, Chairman of the Special Standing Committee on Road Safety of the Hellenic Parliament. In his speech, Mr Oursouzidis presented detailed statistics in the form of audiovisual material on the road situation in our country, as well as information regarding the work of the Special Parliamentary Standing Committee on Road Safety. Mr Oursouzidis also talked about the consequences of the traffic accidents and the pain they cause to the families of victims of traffic accidents, and also to society in general. According to Mr Oursouzidis, policing of roads clearly needs to be increased, but above all, emphasis should be placed on prevention and education, as "road safety education concerns fundamental cultivation of the personality, ways of thinking and behaviour". 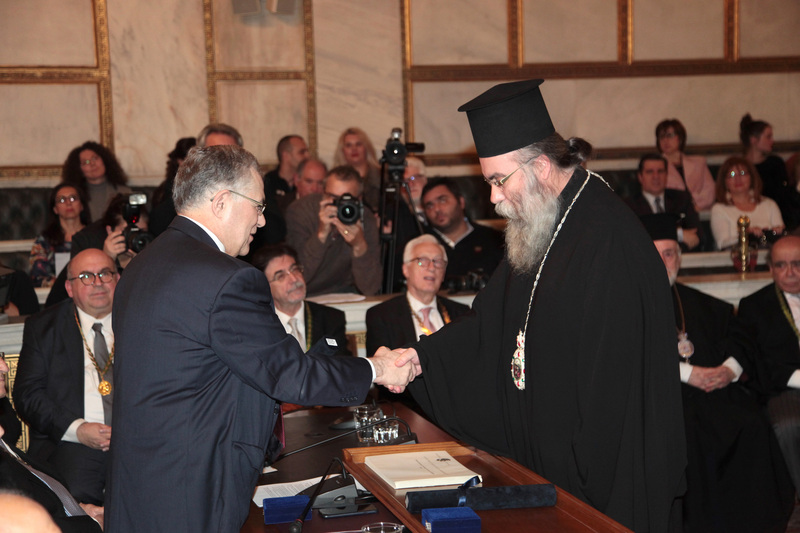 In closing his address, the President of the Republic stressed: "With these thoughts, please accept my sincere congratulations on the whole mission of the Orthodox Academy of Crete, and also on this particular initiative. You have my assurance that you have the full support of the Presidency of the Republic in the fulfilment this mission". It is worth noting that the President of the Republic declared this School Year 2017-2018 to be the "Year of Road Safety". The presentation of students' work was next, coordinated by the OAC scientific staff member, Dr Maria Hatziapostolou. The school delegations came from the Prefectures of Lassithi (1st General Lyceum High School of Agios Nikolaos, 2nd General Lyceum High School Ierapetra), Heraklion (General Lyceum High School of Nea Alikarnassos, Experimental General Lyceum High School), Rethymno (Atsipopoulou Experimental General Lyceum High School), Chania (General Lyceum High School of Kisamos, Kolympari General Lyceum High School, the Patriarchal School of Crete - General Ecclesiastical Lyceum). After completing the presentation of the work, the students proceeded to draft and read the First Declaration of Life before the guests and representatives of local authorities, promising that this would be cause for a new beginning that would lead to the much-needed change of attitude and the defense of life. 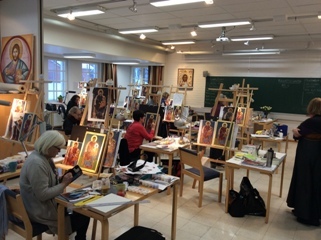 The Orthodox Academy provided warm hospitality to all participants. Among those present were also His Eminence the Metropolitan of Crete Eirinaios and Eminences Metropolitans of Gortyn and Arcadia Makarios of Kydonia and Apokoronas Damaskinos, Members of Parliament, mayors, deputy regional administrators, army Chiefs of Staff, education directors, representatives of various authorities and agencies, teachers and parents of children. At the end of the conference, the Bishop gave keyrings with a picture of the Virgin Mary and Saint Christopher as a gift to all the participants. WHAT IS THE DECLARATION FOR LIFE? The central core of the Declaration for Life" is concern for the crisis of our culture; in essence the crisis of values. It is of great interest that in this conference the Christian dimension of culture was stressed, both by the President of the Republic and by the students themselves. The text of the "Declaration for Life" begins with a verse of the Apostle to the Nations, Paul, (1 Corinthians 6:12-13) "All things are lawful unto me, but I will not be brought under the power of any”, or in other words, “I am allowed to do anything, but not everything is good for you”. Everything is allowed, but I will not be dominated by, and will not become a slave to anything that insults my dignity or threatens my life". Thanks also to the Ministry of Education, Research and Religious Affairs for granting us our educational licence (No. 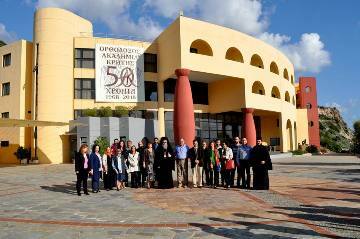 Φ15.1/168121/Δ2/9-10-17), the Regional Directorate of Primary and Secondary Education of Crete, the Municipality of Platanias for their cooperation in making this event possible, but also the Orthodox Academy of Crete, which is completing half a century of life (1968-2018) and continues to minister to every person without discrimination. Emphasis is placed on respecting the human person in the struggle for dignity and human freedom beyond discrimination and abuses, but also to the rejection of the death arising from traffic accidents and their consequences, the text being a great affirmation of life. According to the declaration, "With the strength given to us by taking this step towards dialogue, the belief in universal values, the “person to person” society, the values we serve as people, and the honesty of dialogue among us, we consider it our duty to declare to this meeting, joining our voices together, that this Congress does not intend to condemn, but to raise concern, elevate awareness and awaken people to the burning issue of traffic accidents, which are a matter of life and death". For these reasons, "we believe that the problem of road accidents is primarily a problem of lack of education, which is related both to our behaviour and to our wider perception of the world and life". This is why "the solution lies not in the large fines, nor in strict penalties, but in the way we face life and fellow human beings, because, as we read in the Gospel according to Mark, Chapter 12, Verse 33: "To love him with all your heart, with all your understanding and with all your strength, and to love your neighbour as yourself is more important than all burnt offerings and sacrifices”. In other words, “to love your neighbour as yourself is the most important of all the gifts to God and any sacrifice”. The text of the declaration ends with an invitation to the Greek State, to the Member States of the European Union, to international organisations (such as the UN), to the competent authorities and to everyone of goodwill, in order that we may work together and fight for the much desired change in behaviour and attitudes, and defence of the right to life, and against death from road traffic accidents. The Declaration for Life sends a message loud and clear: "SAFETY FIRST - LIFE IS PRECIOUS. Life comes first!”.